Penn State President Eric Barron. 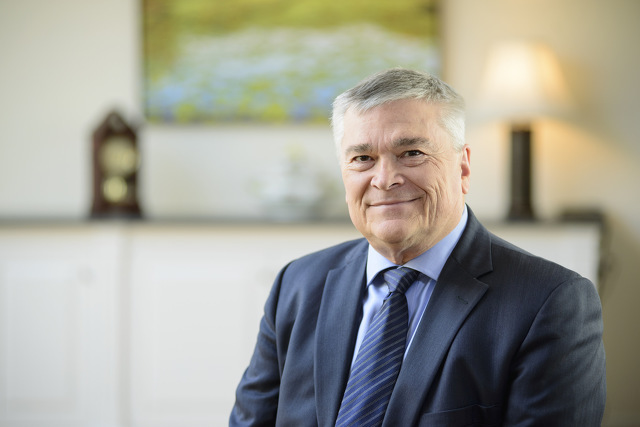 UNIVERSITY PARK — Penn State President Eric J. Barron will return to the local airwaves as WPSU Penn State’s “Higher Education in Focus” debuts its second season. “Higher Education in Focus” will air on WPSU-TV and WPSU-FM. A new, 30-minute episode will air each month during the academic year, with Barron highlighting university-related topics. A student-hosted segment also will debut this season with Lauren Doyle, a senior majoring in both broadcast journalism and theater with a dance concentration, will interview Barron at the end of each broadcast. Episodes will air at 8 p.m. on the following Thursdays: Oct. 15, Nov. 5, Dec. 17, Jan. 21, Feb. 18, March 24, April 21 and May 19. Select topics during the season will include the university’s admissions process, engaged scholarship opportunities and Penn State’s relationship with military students. For more information and to watch archived episodes, visit www.wpsu.org/infocus.